I’m happy to say that Green River fly fishing season is here! Fly fishing on the Green has really started to pick up over the past weeks. This a great time to find some of the best trout on the Green River. 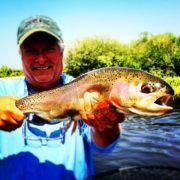 Our guided fly fishing trips on the Green River are producing quality trout versus greater catch numbers. Recent rains and warm air temperatures have caused flows at Warren Bridge to increase to 3000 cfs. The snowpack is still melting out of the mountains and is currently at 136% of average, so runoff will continue for at least another few 2-3 weeks. Water temps are still chilly, but the trout don’t seem to mind! Your best chance to hook a trophy will be with wet flies, so look for trout to be holding in soft currents and on the edges of riffles. Keep your nymphs deep and make sure you take your time on these water types. The fish are in there, but sometimes it takes 5-10 drifts to entice them to eat. It may seem repetitive to make the same cast over and over, but the trout have to see the fly to eat it. With lower visibility in murky water, patience will pay off. Higher river flows puts a lot of food into the water column and the trout are looking for it. There is no need to overthink your fly choices. Flies with some flash or a larger profile are really all you need. If they aren’t eating it, it’s more likely that they haven’t seen it versus being the wrong fly. 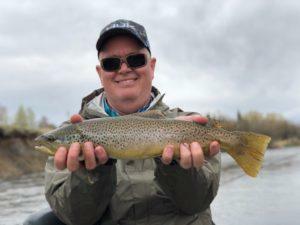 Our guides have using double nymph rigs and tying on San Juan worms in all colors,#4-6 Brown/Black Rubber legs, #10-12 Red or Gold Copper Johns, #10-12 Flashback Pheasant tails and Hares ears. Using a Black Leech as your point fly in this rig is effective also. 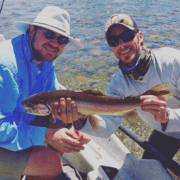 Feel free to call us at 307-690-1139 to book your Green River fly fishing trip! The Green River in Pinedale, Wyoming is in mid-summer form, with flows dropping due to the hot weather. Flowing at 381 cfs below Warren Bridge near Daniel, Wyoming and flowing at 1250 cfs below the Fontenelle Reservoir. Cottonwood Creek flows into the Green River beneath Daniel which creates a small influx of water level which can create good dry fly fishing. With the dropping water levels the trout have started to congregate in the deeper runs. Smaller Chubby’s, Golden Stones, PMD Nymphs, and Copper Johns are all good options to fish in these deep pools. Hoppers should start coming out as well with the hot weather, along with beetles and ants. With lower flows it is best to fish in front of the boat, and make sure that all your line is above the fly. You want your fly to be the first thing these fish see. The Green River would be a good option for a single fly fisherman and guide. This way the fly fisherman can always be fishing in front of the drift boat. It is best to get to the Green early in the morning with the cooler temperatures, once the day starts to heat up so does the water and the fish become less active. 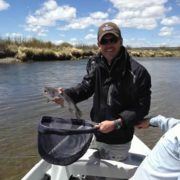 Yet another happy client with Fish the Fly guide Will Pierce! 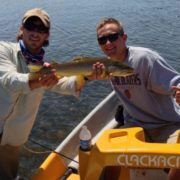 Guide Josh Hanna and Bill Sullivan with a nice Brown Trout on the Green River! Vivian Hernandez having a great day on the Green River with a beautiful Rainbow Trout! Sorry it has been so long since we have written a fly fishing report on the Green River! 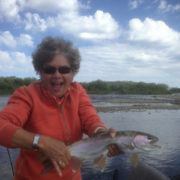 The Green River is fishing very well near Pinedale, Wyoming! The Green River is flowing at 1050 cfs at Warren Bridge, and is flowing at 1700 cfs in the tailwater section beneath the Fontenelle Reservoir. Brown and Rainbow Trout are eating sizes #6-10 Rubber Legs, #10-12 Pheasant Tails, as well as Green and Grey Drake nymphs and the classic Red Worm. There is also some sporadic dry fly action with Golden Stone patterns, but most of the fly fishing is nymphing currently. 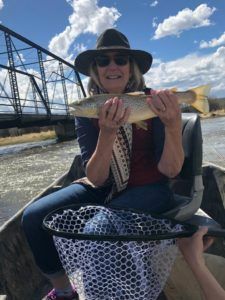 Fly Fishing on the Green River shows the true colors of Wyoming. Hooking into a Rainbow or Brown trout across the river from a herd of cattle is not uncommon for the Green River! Our guides have run numerous trips down there in the last week and have been raving about how awesome the fly fishing is! 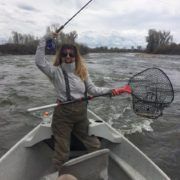 Bianca Noto is loving the Green River fly fishing! Chase Anders is all smiles after landing this great brown trout! This has been one of those rare years where you can float the Green River below Warren Bridge through the month of August. Flows keep wanting to drop to 400 cfs, but then we receive a good bit of rain and flows jump back up between 600 and 700 cfs. Watch for these windows and you can float the Green. There has been a great variety of bugs to choose from this month- early morning Tricos, PMD’s, Hecubas, Mahoganies, all the Terrestrials, and Mutant Stoneflies. Know the timing of all these bugs and you’ll have a fantastic day on the water! Bill Cogdall holds a Green River hog! The Green River has fished well this week! Fly fishing with nymph rigs has been the best game overall, but dry fly action has been solid in the afternoons. Golden Stones, Grey Drakes, and some late season #16 BWO’s have been getting trout to the surface. Green River flows at Warren Bridge have bumped significantly due to rain and the fly fishing has slowed. Look for this to drop over the weekend, and the fishing to be really good by mid-week. Game on! The Green River just outside out of Pinedale, WY has been fishing well recently. Flows had bumped up over 1000 cfs with some warm weather at the beginning of the month, but have dropped over the past few days and the Green is clearing. Water clarity is three feet and the trout are feeding on nymphs and streamers. Double nymph rigs with Rubberlegs trailing Princes or San Juan worms have been effective. 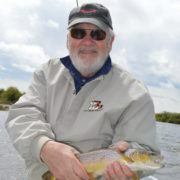 Streamers are best on a sink-tip line to help get the fly in front of the trout. Olive Wooly Buggers, JJ’s Specials, and Natural Dungeons have been the ticket to finding some larger trout. The Green River near Pinedale, WY has had some ice in it recently and the flow gauge at Warren Bridge has been frozen over for awhile now. Flows have actually bumped up with some recent sunshine. Fly fishing has been good with nymphs for post-spawn Brown trout and pre-spawn Rainbows. Access is the main issue but there are a few along Forty Rod Road and snowpack along the Green River is relatively thin. Moisture content in the Wind River Range is looking good at 99% of average currently!